Thalidomide is a sedative drug that was originally developed in Germany in 1954 by the pharmaceutical company Chemie Grünenthal. It was marketed in the United Kingdom by Distillers (Biochemicals) Ltd under the brand name Distaval from April 1958 until late 1961. Elsewhere it has been known as Asmaval, Distaval Forte, Tensival, Valgis, Valgraine. Thalidomide was promoted as a ‘wonder drug’ to treat a range of conditions including headaches, insomnia and depression. It was popular because it was atoxic and so it was impossible to overdose on it. However, long term use led to irreversible peripheral neuritis in a large number of patients. It was then remarketed as a short-term treatment for pregnant women, typically in the first three months of their pregnancy, to combat morning sickness or insomnia although it was also prescribed for bronchitis and influenza amongst other things. It also appeared in cough medicines for children and so often it stayed in medicine cabinets long after its withdrawal from the market. When was the first thalidomide-affected baby born? In West Germany in 1956 to a Grünenthal employee. What damage to babies does thalidomide cause? The main impairments caused by thalidomide affect the limbs and are usually bilateral – either both arms or both legs or all four limbs. The most severe impairment is known as phocomelia which is a condition where the long bones of some or all limbs are misshapen and where the hands and feet, which can be either mostly fully-formed, malformed or rudimentary, arise almost on the trunk. Other impairments cover a wide spectrum of limb disabilities ranging from a substantial shortening of the limbs or entire limblessness to less physically disabling conditions such as fused fingers. Thalidomide also affected the eyes and ears, the cardiovascular system, the gastrointestinal tract and kidneys. Which other conditions resemble thalidomide-induced impairments? Babies have been born with impairments similar to those caused by thalidomide throughout history. For example, genetic conditions such as TAR syndrome and Holt-Oram syndrome both affect the upper limbs in a way similar to thalidomide. Poland’s syndrome affects the hands and Talipes Equinovarus affects the foot and ankles. Congenital dysmelia can also affect all the limbs and can present as very similar to thalidomide impairments. Does the Thalidomide Society support people with similar impairments? The Thalidomide Society supports everyone with a similar dysmelic condition who are encouraged to become members and attend our events. 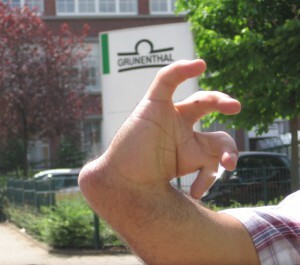 Recent evidence shows that Chemie Grünenthal ignored warnings about the connection between thalidomide and babies being born with limb and other impairments. In 1961, Australian doctor William McBride, published a letter in The Lancet making this connection public knowledge. Following this and reports of what amounted to an epidemic of births of malformed babies and side effects of peripheral neuritis in adults in Germany, Chemie Grünenthal reluctantly withdrew the drug in November 1961 and Distillers followed suit in the December of that year. However, a UK Government warning was not issued until May 1962 but, even then, the drug was also present in a number of other medications whose labelling did not use the word ‘Thalidomide’. Consequently at least 20 children were born during and after September 1962 showing typical thalidomide impairments more than nine months after Distaval was withdrawn. When and why was the Thalidomide Society established? Following the births of thalidomide-affected babies, as there was no medical or social help in place, families formed their own support group. Please go to About Us to find more information on the history of the Thalidomide Society and what we do today. There is no absolute figure for how many babies were affected by thalidomide as many were miscarried, still born or died soon after birth. It has most recently been estimated that over 24,000 babies were born worldwide of which 2000 were born in the UK. In addition, based on medical evidence, experts conservatively estimate that those babies still-born and miscarried, due to thalidomide, would add a further 123,000 worldwide of which 10,000 would have been in the UK. These figures do not include those babies born alive who became victims of state infanticide and so were never registered. Why were some countries more affected by thalidomide than others? In the United States, the thalidomide experience was very different from that in Europe. Fortunately Dr. Frances Kelsey of the US Food and Drug Administration was more alert and would not accept that the drug had been adequately tested for manufacture and distribution. As a result only about 20 thalidomide impaired babies were born in America and these were a result of the limited clinical trials that were carried out. In contrast, in Germany the drug was contained in a preparation called Contergan, which was sold over the counter in pharmacies. The use of Contergan resulted in the births of at least 6,000 impaired children, of whom only 2,000 have survived. These figures are, of course, based on known deaths and survivors and are likely to be much higher. How many people affected by thalidomide are still alive in the UK today? There are currently at least 467 people still alive today in the UK who have thalidomide impairments. Do thalidomide-affected people have children with similar disabilities? Thalidomide did not affect the genes of the people who were born damaged by the drug and so no similar impairments have been passed on to their offspring. Was compensation awarded to UK people born with thalidomide impairments? In February 1968, Distillers paid damages to 62 thalidomide impaired children born in the UK. This was widely recognised as an inadequate sum of money and, following a high profile campaign championed by Harold Evans and his Insight Team at the Sunday Times in 1972, a final settlement of £20 million was agreed in 1973. The Thalidomide Trust was then established to provide support and assistance, including annual grants, to all thalidomide survivors. If you think you might be eligible to receive compensation for thalidomide damage, please contact the Thalidomide Trust. What is life like for people living with thalidomide impairments? Most people born affected by thalidomide have gone on to have happy lives with families and a career. However, the wear and tear on their bodies as they get older has become increasingly notable. The Thalidomide Trust has recently researched issues of health and wellbeing with all of their beneficiaries and the results show that two-thirds rate their physical health as the same or worse than the lowest 2% of the general population. The key health problems noted are: pain which can be severe and / or continuous (90% of beneficiaries noted this), reduced flexibility and mobility which make it difficult to undertake everyday tasks, tingling and numbness as well as poor mental and emotional health which includes anxiety and depression. The cost of specially tailored clothes, prosthetic limbs, wheelchairs and hearing implants has been noted as difficult to cover financially particularly as over 40% find they are no longer able to work due to their disability. Is the compensation received by thalidomide survivors fair and adequate? No. Thalidomide survivors receive an annual grant from the Thalidomide Trust and a government-funded health grant, the unmet health needs as they get older are not covered. The Thalidomide Trust’s National Advisory Council (NAC) are currently campaigning to get the German government to take responsibility for their role in the thalidomide scandal and to help to close this funding shortfall. You read more about their campaign here.